Oculus' annual developer event, Oculus Connect, kicked off on September 26 with a huge announcement: Project Santa Cruz is ready for the world. The headset, now called Oculus Quest, fills in the middle of the Oculus portfolio. It's not as a powerful as a PC-based headset but with 6DoF tracking it's far more immersive than the 3DoF Go headset Oculus released earlier this year. To showcase all three platforms, Oculus took over the main hall of the San Jose Convention Center - offering convention goers, developers and members of the press a sneak peek at the next wave of hit VR titles. Not there to attend in-person? Here are the 10 best games we saw at OC5. After the keynote we made a beeline for the new Oculus Quest stations to go hands on with the new 6DoF headset. First up on the agenda was Superhot VR - a port of the award-winning VR game, now with complete freedom of movement. Superhot, if you've never experienced it, drops you into a deadly firefight ... repeatedly. Your goal is to kill all of the red, polygonal enemies around you using your fists, various weapons and randomly placed household items without getting killed yourself. The catch is that the enemies only move when you move, allowing you to stop time to think about your next action. Playing Superhot on Oculus Quest was organized chaos. With the freedom to move whenever, wherever without the constraints of a cable holding you back the entire battlefield became an open playground. You could duck, strafe and jump without fear of bringing your entire system crashing to the ground, making this upcoming version the best yet when it comes to the headset in 2019. From what we saw during our demo at OC5, Oculus Tennis Scramble is going to be the Wii Sports of the Oculus Quest - a fun multiplayer experience that everyone will use as a benchmark for games on the platform going forward. That being said, while Tennis Scramble wasn't the most unique premise we've ever seen for a game, the execution is fairly fun. At the event, Oculus pit two players against one another in small tennis courts. You were free to run around the court and the Guardian system did a good job of letting you know when you were too close to exiting safe space. What was most impressive about the game was how seamless it was playing against someone else in the same room while in VR. This herculean feat requires both headsets to be aware of their surroundings while still seamlessly sending data to the other headset. Say what you will about the Wii Sports copycat, but Oculus Tennis Scramble proves that local, PC-free multiplayer VR is not only possible, but it can actually be reasonably fun, too. One of many new multiplayer games coming to Oculus in the coming months, Echo Combat will look immediately familiar to anyone who played last year's Echo Arena, and uses the same mechanics. As the name suggests, rather than Echo Arena's frisbee/soccer gameplay, Echo Combat is based on the rather more familiar premise of shooting enemies in the face. We got hands-on with Echo Combat at a press preview ahead of OC5, playing a capture-the-flag style mission. The zero-gravity navigation takes some getting used to; although you can use wrist-mounted thrusters to propel yourself, you'll often get around by grabbing objects and pushing yourself away. Helpfully, you can also grab onto other players (in our case, one of the developers, who knew the level like the back of his controller) and hitch a ride. The experience left us a little queasy after half an hour, but it was great fun and we were sorely tempted to go back for more. A real-time strategy title built specifically for VR, Final Assault tasks you with the usual RTS objectives of managing and deploying resources and troops. However, it's nothing like the ponderous point-and-click games of yore - Final Assault throws you straight into the action, inviting you to grab your troops and start attacking immediately. Developer Phaser Lock specializes in VR interpretations of classic game genres, and its two previous releases were a Pilotwings-style flight sim (Final Approach) and a first-person bow and arrow shooter (Twisted Arrow), so it'll be interesting to see how its take on this genre goes down with RTS fans when it's released later this year. The sequel to the stunning Lone Echo (set in the same universe as Echo Combat and Echo Arena), this game follows the same characters, human Liv and robot Jack, aboard a space station. Lone Echo II was only available as a 360-degree cinematic trailer at the pre-conference event. so we can't say much more other than things seem to have taken a turn for the worse, and Jack is being patched up by an anxious Liv with limited success. 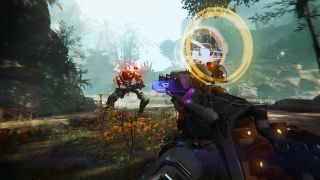 We'll be interested to see how Ready at Dawn has developed the game's zero-gravity physics since the last game - and especially how it compares with Echo Combat, which left us a little queasy. Energy weapons and jetpacks are a winning combination. Space Junkies offered the most unadulterated fun of the titles we tried at the Oculus pre-event, and had all the polish you'd expect from a big-name developer. The game is billed as a 'VR arcade shooter', and we took part in a multiplayer tournament blasting our way around one of the game's orbital arenas (an 'orena'). You operate each of your limbs individually (an experience Ubisoft calls 'full embodiment'), which feels far more natural than you might expect. The weapons are all fun to handle too; we were particularly fond of the slingshot, which requires you to pull back and aim your explosive projectile before launching it (ideally not too close to your own face). The game is currently in closed beta, and is due for release at the end of this year. It's definitely one to keep an eye on. Putting a new twist on the idea of traveling to find yourself, Stormland (by Insomiac Games, the developer behind Spider-Man for PS4) places you in the chassis of a nature-loving android whose parts have been scattered to the wind by a band of malicious invaders - the Tempest. Left to rust in the wilderness, you must not only track down your missing friends, but also augment yourself to survive in a world that's a lot less peaceful than you remember. Flight is a key part of Stormland, and it's exhilarating soaring and gliding though the landscape using a kind of jet-powered parkour. You can play Stormland alone, or team up to explore your ruined world with fellow robots once it hits the Oculus store next year. If you can't wait for the next generation of Oculus titles, you'll be pleased to know that one of our favorites from the show, VOX Machinae is available now, priced at $24.99. This game, from indie developer Space Bullets Dynamic Corporation, is a new take on that tine-honored classic: piloting giant mechs. Stomp through rugged mountains, deserts and jungles, use your mech's jets to take vast leaps (it's more like jumping than flying, which makes sense considering you're steering several tons of virtual steel), and unleash a vast arsenal upon your enemies - ostensibly in the name of gathering scarce raw materials from a desolate planet. The controls feel natural (though you'll have to keep a close eye out for overheating weapons and depleting jet fuel) and there's support for up to 16 players, leading to the best kind of chaos. Defector slips you into the tactical brogues of an international secret agent, equipped with advanced weapons, an enquiring mind and, when all other options fail, a solid left hook. It's not all action, though - there's also a conversation system that uses your choice of words to direct the plot. Still more James Bond than George Smiley, but it's refreshing to have some actual espionage in a spy game. One of the last stops on our Oculus odyssey was the planet Mustafar for Star Wars: Secrets of the Empire. Designed for VR arcades, Secrets of the Empire uses location-based tracking, environmental sensations and VR headsets to send you to Darth Vader's secret base to recover an important package vital to the rebel cause. The game works like this: Before heading into the preparation space, you're shown a brief video that explains why, exactly, you need to go to the dark lord of the sith's residence for a visit. The video (which includes a cameo by Captain Cassian Andor from Star Wars: Rogue One) sets the stage for the experience and gives a brief overview of what to expect. You're then taken to a fitting area where you're outfitted with a haptic vest, headphones and, most importantly, a VR headset. You're then shepherded into the maze of rooms that, thanks to the magic of VR, disappear into the volcanic landscape of the planet Mustafar. While this wasn't a traditional Oculus Rift demo in the sense that it had you tethered to a PC or use a pair of touch controllers, it was a nice example of what VR could do in a large-scale, set piece experience.